We have waited 33 years for this moment, for the time when we could hold up our heads in world racing and say “There goes a Briton, Champion of the World in the professional game”. This is the hardest side of the sport, and a young miner’s son from Durham has proved that anything a Belgian or a Frenchman can do, we can do just as well. To those here and in other countries who have made Tom Simpson their idol, this is a wonderful moment, a moment to be treasured for the rest of our lives. But what is so surprising is the incredible popularity of the win in the foreign press, in the minds of the continentals who came to the race. For them this is more than just another win, it is an outstanding win, and one which will do the sport itself a power of good on the continent. For the lesson of Tom Simpson is more than just physical strength, it is that professional sport is a matter of popularity as well as pure skill, and Tom has never needed a public relations officer. Tom himself has always kept at the front of his mind that he is a Briton, and he has always in championships raced as one. He is intensely proud, and willing to help the sport in any way. It is up to us to try and do two things, first to produce a number of men and women who can back him up, and second to ensure that the sport is run so that sponsors will come forward to build up a really representative team. And when Tom retires we should have no need to look further than Ghent for our first paid national team director. So said Alan Gayfer, ringing from San Sebastian on Sunday night, and here is Tom’s own story of how he won the rainbow jersey. “This was an easy race for me, really easy – I never felt anywhere that it was hard. “It was not that I disregarded the others, or believed that the race was not important, but I never felt in better condition than when I started this championship. “For one thing, we professionals, we British pros, had decided that we had had enough of losing championships and that this time we were all working together – it was to be the best men to the front and all work together, like the continentals do, instead of each going out, one by one. (Alan Ramsbottom, with an old score to settle with Anglade, shot on to the French rider’s wheel each time that he made a serious effort – and he made a lot – and thoroughly broke the French champion’s spirit by the finish of the race, thus eliminating, by patient work, one of the most inteligiant riders in the game who would have organised effective counter-action with the rest of the ‘tricolores’). “We’ve proved that we can beat anyone when we set our minds to it, and now I want to see some moves towards having a real British sponsor – one who can support a complete team on the continent and show them what we can do when we really go to town. “The hardest part of the race was the fact that the other riders did not do their share in the break. “Not that they were unwilling – we all had the world title as our aim – but they simply could not keep up the pace which was necessary. “When Rudi and I found out that the end was getting near, and we saw how tired the others were, we simply went off on our own. “Rudi worked hard, and worked well. He never stopped doing his bit at the front – I suppose he was as confident as I was, because I was confident, I was sure that I could win even though I have been told since that Altig was surprised by my sprint. “I can sprint with the best of them when I want to, and when I’m not tired out with earlier efforts. Which usually I am, I don’t fear anyone and I never have. “I have said this to all of you in Cycling – have faith in yourself and in your ability to win, and you will get there. “What happened was quite simple – I heard Rudi change gear, and I thought his chain was slipping. “You only get opportunities like that once in a lifetime, and I jumped at it. I dared not look round, that is fatal, but I knew he had not passed me, and I had achieved my lifelong ambition – I was Champion of the World. Outsprinting Rudi Altig, one of the greatest of current roadmen sprinters, when we all thought that he would have to for a long one to stand a chance, Tom proved that he had nothing to fear from anyone, after a race which he led, with Barry Hoban, from start to finish. The uproar, the fantastic mess of Spanish policemen, cyclists, enthusiasts, women, children, journalists, everyone who could get on to the road reminded me of only one thing, the incredible crowds in Piccadilly Circus on VE night. The whole stadium on each side of the road exploded with joy, journalists turning round from all parts to congratulate the little British contingent, Sidney Saltmarsh, Ron and Cath White, Dave and Margaret Saunders, Ken Pragnell and myself, the few privileged British newsmen to witness this unique occasion. To get to the road I had to leap over a seven foot wall into a muddy ditch to where Simpson stood radiant with joy, smeared with mud in the falling drizzle, but satisfied that he had proved the whole world wrong. Indeed, Barry had started the break which made the decision on the first lap of the championship and Simpson, with Altig (already they were together) rapidly sized up the situation and caught it on the second circuit, in the bright Spanish sunshine. Lap after lap the gap between their pursuers rose, until at last it reached the satisfactory level of three minutes, and Jean Bobet walking through the pits told me he thought it would be a good one. The rest is Simon’s story, the story of a man who at the feed refused the bottles that the others wanted because already in his dedication to the job in hand he was concentrating on making not the slightest slip which could bring about the catastrophe which he has so often this year stopped him from winning. Here was a great rider in action. Barry Hoban kept up the pace for three quarters of the race, making sure that only the very best riders could work their way to the front and join the break. One or two did, but soon after Barry had had enough, Anquetil, Poulidor, Perez-Frances, Wright, choice names these, abandoned the useless struggle against the flying 13 men in the front. Yes, even Jaques Anquetil and Rik Van Looy, Ward Sels and former world champion Jean Stablinski, try as they might, could make no impression on the group. By the time Anquetil had given up, he was more than 11 minutes in arrears, beaten by the best man in the world – Tom Simpson. Two laps from the end, after lapping steadily around the 28 minutes for the 11 and 3 quarter miles, Tom and Rudi decided they had had enough, and simply rode away from the rest of the break. This was the classic road race situation, the strong men to the front and damn the rest. Tom and Rudi did not make the mistake that Ritter and Beugels had made. Good professionals, both hungry men with spoiled seasons, they worked together to ensure that when the finish came it would be between the two of them and no one else. There was no doubt about it – mile by mile they increased their lead, working fantastically hard and wonderfully smoothly, exactly as if it were a film on how to ride a race. Tom tried his hardest to drop Rudi on the last climb of the hill on the circuit but the big German called on all of his tremendous strength and hung on, though the lines on his face indicated the effort he was making. Over the top and down through the little village of Lasarte, neither of them willing to take risks on the slippery road in the drizzle which had begunt o fall, and both cornered carefully, knowing that they had sufficient lead – nearly three minutes – not to be worried. They came past the car parks still doing “bit and bit” – loyally we held our breath. Then as Rudi slipped into his 13 sprocket for the final sprint – an uphill one – Tom kept on his 15 teeth and simply rode away from him with a real sprinter’s jump. Poor Rudi, frozen with nerves, as he admitted afterwards, could do nothing but watch the Englishman’s wheel get further and further away from him, while we stood in the stands and watched it happen, the res and blue jersey steaming in ahead of the white, black and red. The big German could only shake his head in disbelief. Good? Tom Simpson, everyone agreed, will be a shot in the arm of the sport, will give it a new lease of life on the continent and at home. Oscar Daemers, Ghent track promoter and a life-long enthusiast of cycling and for British cyclists, said “He will be riding in my first six day race on the new track at Ghent this winter, that I agree. Thousands of Belgian supporters who had come to cheer on Rik Van Looy surged forward with their supporters’ hats still on their heads crying out “Tom, Tom, Tom,” and “Seempson,” in their joy at seeing the man they regard as local bring home the bacon. Rik himself came forward with Oscar Plattner, the former world sprint champion, already making offers for Tom to go and ride in Switzerland. 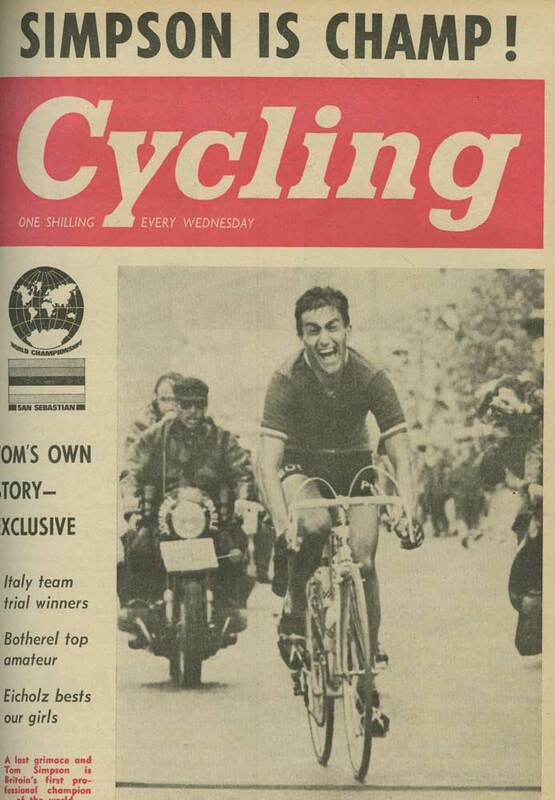 Barry Hoban was the next British rider to finish. Followed by Alan Ramsbottom, both of them with tears in their eyes because the man who is the leader of British cycling on the continent had won. Then, as Vin Denson came in with a very late group, we called to him, and the tall Chester man came forward to embrace Tom in true continental fashion, while the phlegmatic Keith Butler shook his hand warmly. Michael Wright had awaited Tom in the pits, content that he had done his bit – he had abandoned the lap before to await Tom’s arrival. There was Norman Sheil too, the last British World Champion, who throughout the race had been on the edge of the pits. “I was suffering more than any of them, wishing I were among them,” Norman told Cycling as he massaged Tom’s wet legs and made sure that the new champion – yes, he is the new champion, was dry and comfortable. Gianni Motta stood by sadly. Watching the new champion go by dressed in a shining Peugeot jersery which he had exchanged for his soiled British vest. Tom was swept off his feet down the road hardly knowing whether to laugh or cry, answering questions from all angles, talking to the microphones which were thrust at him and lifted up onto the winner’s rostrum to the eternal astonishment of the Spanish police who could not believe that any Englishman could be champion, least of all in Spain, riding all the Spanish champions into the ground. But we all shouted in unison “El Campeonato El Campeonato,” and they finally drew back in awe of from this man who came towards them, surrounded almost smothered. Tom Simpson is Champion of the World. 2. R. Altig, West Germany, at 3 lgth. 4. P. Post, Holland, st.
5. K.-H Kunde, West Germany, st.
7. A. Den Hartog, Holland, st.
8. F. Balmamion, Italy, st.
9. F. Gabica, Spain, st.
Butler; Denson, both at 12-56.